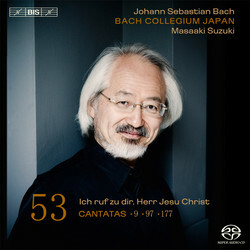 The three cantatas on this recording come from the first half of the 1730s, by which time J.S. Bach was no longer writing a new cantata every week. In these later works, Bach’s affinity for instrumental colour is coming more clearly to the fore, as are elements of the new ‘empfindsamer Stil’ with its tendency towards expressive melodies rich in syncopations and suspensions, and towards homophonic writing. The three cantatas are also linked in that they are all chorale cantatas, harking back to Bach’s second year in Leipzig (1724–25), when the cantatas that he wrote were each based in their entirety on a well-known hymn. The opening cantata, In allen meinen Taten BWV 97, is a setting of nine strophes from a poem by Paul Fleming, one of the great German baroque poets, and begins with a splendid French overture, in which the orchestra intones a solemn, slow introduction with the typical dotted rhythms, followed by a lively fugal section during which the choir makes its entry. This is followed by BWV 177, Ich ruf zu dir, Herr Jesu Christ, which at its centre has the aria Verleih, dass ich aus Herzensgrund… a heartfelt prayer from the soprano and oboe da caccia for the capacity to forgive one’s enemies. The hymn Es ist das Heil uns kommen her, on which the closing BWV 9 is based, remains an important hymn in the German Evangelical Church. The text – and Bach’s setting of it – eloquently conveys the message that it is through faith rather than deeds that mankind may achieve salvation.